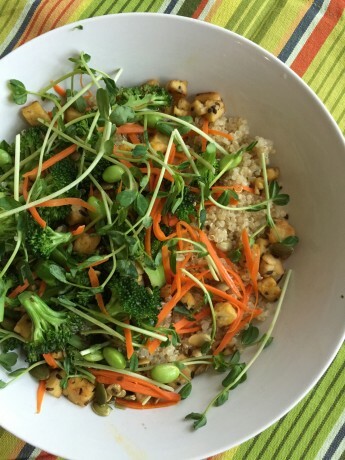 Here is a perfect protein salad for today – featuring a triple dose of protein from quinoa, tempeh and edamame beans – along with broccoli and other veggies. To cook quinoa perfectly always add less than 2 cups water - 1 2/3 seems to work best. You can make this ahead of time, just reheat in the microwave, then top with sprouts, pumpkin seeds and the lemon tahini sauce. To cook the quinoa, put quinoa in a small or medium saucepan and rinse with water. Strain, using a fine mesh strainer. Add 1 2/3 cup of water and 2 pinches and bring to a boil. Reduce heat to low, cover, and cook for about 13 minutes, until all the water is absorbed. Remove from heat. While quinoa is cooking, heat 1 tablespoon of the olive oil in a large skillet over medium to medium high heat and stir-fry the broccoli for 3 to 4 minutes, stirring constantly, until crisp tender. Add a pinch of salt to the broccoli while cooking. Remove to a bowl. Sauté the carrot in the same pan for about 1 minute. Remove carrot and add the other tablespoon of olive oil over medium to medium high heat and sauté the tempeh for 4 to 5 minutes, mixing often to brown as many sides as possible. Set aside. Put the frozen edamame beans in a strainer and run under hot water for 1 minute to thaw. To make the tahini sauce, in a small bowl, whisk together the tahini, lemon juice, water, garlic, soy, parsley and olive oil. Try over a sample of the ingredients, and make any adjustments. The bowl: 1/4 of the quinoa into a bowl and top with broccoli, carrots, soybeans, tempeh croutons, pea shoots and pumpkin seeds. Top with desired amount of sauce, about 2 to 3 spoonfuls. Enjoy and feel energized!